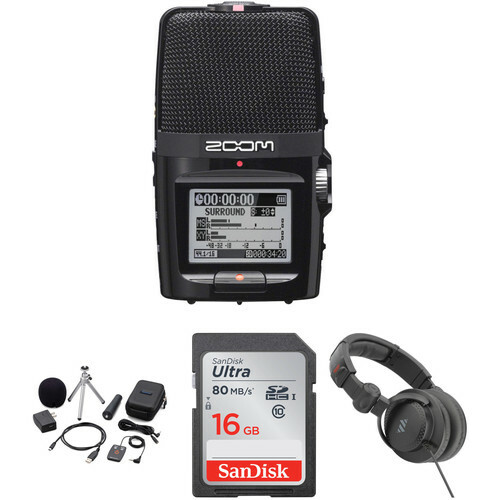 Whether for use in film and broadcast applications, journalism, podcasting, musical performances, or rehearsals, the Zoom H2n Portable Recorder Value Pack is a B&H Kit that delivers extended functionality to an already versatile handheld recorder. The accessory package includes several mounting options, a remote, USB connectivity and charging, windscreen, cable, and more. Added to this combination is a pair of headphones for monitoring, and an additional memory card for extended recording time. Perfect for chamber ensembles, string quartets, and small jazz combos, the Zoom H2n offers a powerful set of features for one-mic recording. If you’re a studio cat, you’ll appreciate its ability to record 96 kHz/24-bit audio files. Recording enthusiasts will appreciate its switchable array of five microphones—all of which provide an immersive audio experience. The H2n also works as a 4-in/2-out USB audio interface, recording multi-tracked audio straight to your computer. Podcasters can use the unit as a USB mic. A simple dial on top of the recorder lets you switch between traditional XY stereo, 2-channel surround, 4-channel surround, and a mid-side stereo mode. The mid-side mode allows you to adjust the width of your stereo field for flexibility. When recording in RAW mode, you can even adjust the field after you've made a recording. The H2n records to widely available SD and SDHC flash memory cards, and supports capacities up to 32GB. When using a 32GB card, you can capture up to 50 hours of CD-quality WAV files, or up to 555 hours of stereo 128 kb/s MP3 files. An integrated reference speaker helps to review your recordings to make sure everything has been captured properly. The streamlined and intuitive interface puts critical controls right at your fingertips. The large 1.8" backlit LCD display makes it easy to navigate through system menus and monitor audio levels. The analog-type mic gain wheel lets you make precise adjustments on-the-fly. If you'd like to connect external equipment, the H2n provides you with a 3.5mm mic/line input, allowing you to hook up your favorite microphones, instruments, and other sound sources. A 3.5mm headphone/line output makes it easy to connect headphones, portable speakers, and other devices. A remote jack lets you connect the optional wired remote to start, stop, and pause recordings, as well as add marks. It also reduces handling noise for the cleanest possible recordings. A high-speed USB 2.0 port lets you transfer recordings to your Mac or PC. You can even use the H2n as a live USB mic, terrific for VoIP chats and podcasting. An activation card for Steinberg's WaveLab LE and Cubase LE software is included, and once downloaded, they will give you audio editing and mastering tools to help you turn your recordings into finished masterpieces. The H2n offers a number of versatile powering options. It offers over 20 hours of continuous operation on a pair of standard AA alkaline batteries. It can also be operated via USB bus power or an AC adapter (sold separately). In the event of battery failure or accidental power loss, your recordings won't vanish. A data recovery function will automatically restore your data the next time the recorder is powered on, so you don't lose one-of-a-kind audio moments. Other features of the H2n include a lo-cut filter, a compressor/limiter, auto gain, pre-rec, auto-rec, a tuner and metronome, variable speed playback, key control, A-B repeat, file dividing, normalize, MP3 post-encode, marker, and surround mixer to give you useful tools for a variety of applications. The compact design fits in the palm of your hand and can be taken practically anywhere. This makes it ideal for film and broadcast applications as well as journalism, podcasting, musical performances and rehearsals, and much more. The H2n has 5 high-quality mic capsules, more than any other portable recorder. This unique 5-mic design enables the H2n to record with 4 selectable patterns. A simple dial on top of the recorder lets you switch between traditional XY stereo, 2-channel surround, 4-channel surround, and a mid-side stereo mode. The mid-side mode allows you to adjust the width of your stereo field for flexibility, setting the perfect amount of ambient/surrounding noise. Commonly used in film and broadcast, mid-side recording combines a unidirectional mid mic that captures sound directly in front of you and a bidirectional side mic that captures sound from your left and right. By increasing or decreasing the level of the side mic, you can control the width of the stereo field. When recording in RAW mode, you can even adjust the field after you've made a recording. The 90° XY stereo condenser mics are arranged with the left and right mic capsules on the same axis to ensure perfect localization and eliminate phase shifting. This provides accurate depth and imaging for stereo recordings. By using the mid-side and XY mics together, you can create 360° surround sound recordings in either 2-channel or 4-channel modes. The H2n records to widely available SD and SDHC flash memory cards, and supports capacities up to 32GB. Depending on your needs, you can record uncompressed WAV files at up to 24-bit/96 kHz or compressed MP3 files at up to 320 kb/s in order to fit more hours of data on your memory card. When using a 32GB card, you can capture up to 50 hours of CD-quality 16-bit/44.1 kHz WAV files, or up to 555 hours of stereo 128 kb/s MP3 files. An integrated reference speaker makes it easy to review your recordings to make sure everything has been captured properly. The streamlined and intuitive interface puts critical controls right at your fingertips. It includes a large record button on the front panel, as well as a jog dial/transport control on one side and a volume control on the other. The mic-gain wheel allows you to set the perfect amount of gain for your application, giving you convenient tactile control, as opposed to digital volume controls, which are not always as precise. The large 1.8" backlit 128 x 64 LCD display makes it easy to monitor audio levels and navigate through system menus and functions. The 3.5mm mic/line input allows you to hook up your favorite microphones, instruments, and other sound sources. A 3.5mm headphone/line output makes it easy to connect headphones, portable speakers, and other devices. A remote jack lets you connect the optional wired remote to start, stop, and pause recordings, as well as add marks. It also reduces handling noise for the cleanest possible recordings. A high-speed USB 2.0 port lets you transfer recordings to your Mac or PC. You can even use the H2n as a live USB mic, suitable for VoIP chats and podcasting. The H2n can also act as a high-speed USB card reader. Steinberg WaveLab LE and Cubase LE are both included. The H2n offers over 20 hours of continuous operation on a pair of standard AA alkaline batteries. It can also be operated via USB bus power, or an AC adapter (sold separately). In the event of battery failure or accidental power loss, your recordings won't be lost. A data recovery function will automatically restore your data the next time the recorder is powered on, so you don't lose one-of-a-kind audio moments. You can set the H2n to automatically start recording at the presence of audio. The pre-recording function will always "listen" and store a few seconds of audio in a memory buffer, so if audio starts suddenly you don't miss the beginning of a recording. An advanced Auto Gain Control (AGC) and lo-cut filter allow the H2n to record audio at the most appropriate level while minimizing unwanted noise without having to adjust settings. If desired, you can also adjust the gain levels manually with the mic gain wheel. The built-in compressor/limiter puts a cap on maximum audio levels to ensure that your recordings remain distortion-free. The H2n allows you to split any recorded file right inside the unit without external editing hardware or software. The normalizing and MP3 post-encode features let you set the optimal volume level and convert WAV files into MP3s. A perfect tool for musicians, the H2n has a built-in tuner and metronome to keep you on pitch and on tempo. You can adjust the playback speed and key of a recording; ideal for music and singing applications. The repeat function lets you repeat a chosen segment of a recording, ideal for studying or practicing music, speeches, and more. You can set markers at important points and also perform surround mixing right in the recorder for on-the-fly refinements. The separately available APH-2n accessory package includes a wired remote with an extension cable, windscreen, USB AC adapter, USB cable, adjustable tripod stand, padded case, and a mic clip adapter so you can get even more out of your H2n. The package also includes a foam windscreen to reduce the effects of wind and breath noise, a USB AC adapter and USB cable for convenient powering, an adjustable desktop tripod stand, a padded carrying case, and a mic clip adapter so you can mount the recorder on a standard microphone stand. The HPC-A30 Closed-Back Studio Monitor Headphones from Polsen are designed for monitoring audio in studio, field, mobile, and DJ applications. They feature 50mm drivers that provide a frequency response of 18Hz to 22kHz for accurate reproduction of your audio. The ear cups on the HPC-A30 have an around-ear (circumaural), closed-back design, allowing for the increased isolation often desired while tracking or monitoring playback. Additionally, the ear cups can be pivoted for single-ear monitoring. The headphones have a collapsible folding mechanism for compact storage and transport. A padded and adjustable headband provides comfort during extended use. The 32 ohm impedance allows for ample volume when used with mobile devices. The headphones have a single-sided, 9.8-foot cable that terminates in a 3.5mm stereo connector. A 1/4" adapter is included for additional compatibility. Box Dimensions (LxWxH) 6.3 x 5.9 x 3.6"
Box Dimensions (LxWxH) 4.3 x 4.0 x 0.1"
Box Dimensions (LxWxH) 8.7 x 7.4 x 3.8"
H2n Portable Recorder Value Pack is rated 4.6 out of 5 by 12. Rated 5 out of 5 by Beenie from Better than my old Zoom H2 I bought this to replace my aging Zoom H2 from 2009. I like the larger display and simpler layout. The remote is wonderful; my old model never had one. I mainly use this for an annual music convention where I jam all night with a group of acoustic musicians. The sound quality is excellent, considering these are amateur recordings. I am also happy that, unlike my old Zoom that only took 4 GB SDHC cards, this new model takes cards up to 32 GB, which eliminates the need to carry multiple cards at my convention. I still had plenty of room left over on my SDHC card, even after more than 10 hours of recording. This is a great product for people who want to record rehearsals and jams. Rated 5 out of 5 by Swan from Very satisfied and user friendly! Everything in one place and a terrific price. Dont forget the student discount if you are a student. I am recording an audiobook and this kit has everything that I need. Instead of piecing everything together this includes things which I probably wouldn't have purchased. Love the earphones and mic stick. Some kits are full of this you don't need. I especially appreciate the remote. Also, I could have bought the pro recorder but I like the user friendly like of this unit. It's something that people can relate too. I don't like the mics on the other recorders. Rated 5 out of 5 by mike from Excellent recorder From analog (tape, to the kids) to digital I have accumulated a pile of small audio recording devices in my desk drawer over the course of the last couple decades while working as a writer/editor. My smart phone ended up replacing all of them. Until I needed the Zoom H2n. Wow. I was drafted to run and moderate a series of focus groups. After the first one, I realized that the cameras we had set up and my phone were all lacking the audio clarity to transcribe the notes my client was paying for. I took a chance and bought the H2n. I tested it a little at home with the directional microphone before I had to use it in a roundtable focus group discussion in real time on the little tripod stand. A week later, I played it back on the set of Polsen headphones that came with the value pack, and all I could think was WOW! I could close my eyes and envision the responsesboth audibly and visuallyfrom each of the participants. The clarity and direction of the mics brought me right back to the interview table. The surveillance cameras in the first session couldn't pick up and relay to my mind what the directional audio did on the H2n. Rated 3 out of 5 by Jesse from It's alright for the price So this product has great sound quality if you are up close to the mic, especially if you are using a windscreen. But as far as build quality, it seems quite cheap. The headphones that come with it are really cheap quality. But for 200 bucks it isn't that bad. The SD card slot is on the bottom, which is not ideal if you have it on the mini Tripod they send. For the same price roughly, I would just by the h4n pro, way better build quality. Rated 5 out of 5 by James from Small and effective This recorder is great for the video I record at live events where I cannot put lav mics on each speaker. I can set it on the podium and let it run to capture decent audio from the presenters. Much better than trying to record the room from a distance and better than trying to plug into the house system in most cases. It has a variety of mic settings for different situations and makes great recordings. Rated 5 out of 5 by Alex Drums from Awesome Does exactly what it need to. Lightweight. Portable. Easy to use. Great sound quality live. I've used this for live recordings so far and it captures the sound really well. It's still a low budget device so don't expect to be blown away with high fidelity but for amateur bands that need quick, live recordings for cheap, and to easily mix and master yourself and put up online, this is the way to go. Rated 5 out of 5 by Scott from Had What I Needed The last time I used a recorder it had a cassette in it. The tech guy at work recommended this and said "B&H" was a "reliable vendor. So far, fooling around with it, it seems fine. The kit was the right choice because it had everything I needed. Rated 3 out of 5 by Kenneth from Nothing Exceptional The H2n has a lot of issues that make an otherwise good idea pretty bad. For starters, the mics are not very sensitive. I keep the gain all the way up all the time and I still can't reach -12Db to -6Db unless I'm within two feet of the recorder.Secondly, the construction of the recorder is entirely cheap plastic. It feels cheap and lightweight, nothing like the H4n.Thirdly, the device does not work well as a USB mic. So far every recording I've made has suffered from problems with mismatched sample rates despite using both the 44.1 and 48kHz options available.Lastly, the accessory pack is nearly an absolute requirement for having this device. That's not a good thing. Even very basic things like an appropriate USB cable are not included with the H2n. All you get in the box with the H2n is the H2n itself, a pair of batteries, and a 2GB MicroSD card. You have to spend an extra $ just to get a useful device.All that said, I'm still giving the device three stars because it still functions well as a recorder for external microphones, and it still does decently as a standalone recorder.